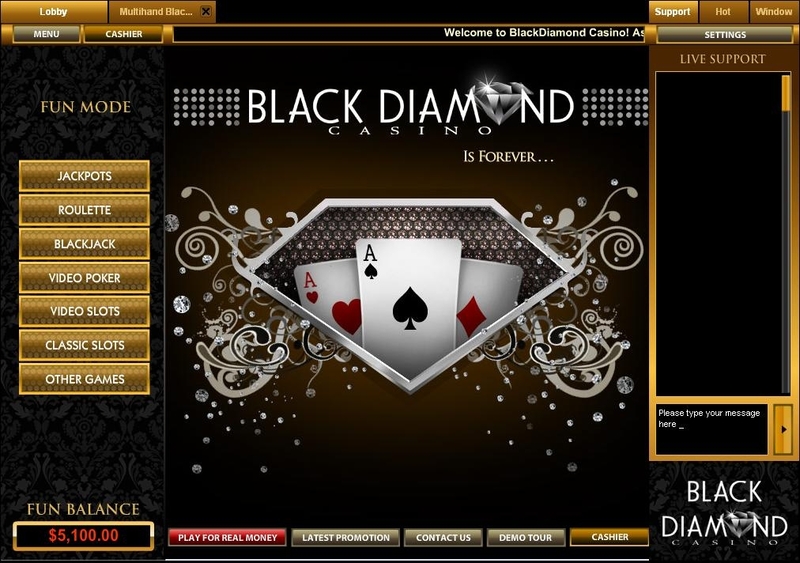 Black Diamond was launched in 2009 and currently runs Topgame software. In its early days it gained a reputation as the ‘go-to’ Topgame casino before bizarrely changing to Rival games. Happily, it’s back to Topgame, so can hopefully regain its place at the top of the perch. The Black Diamond website is a pretty glitzy place, themed in black and silver with lots of sparkles and animations. If you’re a Roulette player, that lavish, classy impression is backed up when you play there, as there are a couple of Roulette tables that are exclusively for VIP players. But it’s in the Roulette suite where Black Diamond really excel. They have five different versions (Swipe, Electronic, Black Diamond, Crystal and Titanium). Swipe Roulette is a fully interactive 3D version of European Roulete, where you can choose the camera angle and also spin the wheel yourself! Titanium Roulette is a VIP only table with a table limit of $500. Black Diamond Roulette takes that a step further offering a maximum bet of $1,000 – again, for VIP players only. Players need to know that they’re playing at a genuinely fair casino, and Black Diamond go out of their way to assure you that that’s the case. They are more than happy to publish security certificates from two of the most respected bodies in the casino industry – SRC Security Research & Consulting GmbH, and Gaming Laboratories International. Black Diamond Casino offers support services 24/7. Players can get in touch with a representative directly through the website or the casino client through live chat technology. The casino can also be reached by email. While the responses are not instant, Black Diamond Casino uses 4 different email addresses for different types of inquiries, speeding up response times. Black Diamond Casino’s software platform, Top Game, has been independently audited several times over the years. Firms such as TST have shown that the technology behind the software is genuinely random. Additionally, the casino gladly provides full records of play to any player who requests them. Another casino with big bonus just to try this games and read carefully because they are just to try their games, which means you cant cashout from them so the bonus is not cashable so it’s fun money. I really don’t understand this kind of casinos, what is the therm of no deposit bonus, did anyone tell them, that’s all dear casinos should be free bonus where players could take advantage of it and cashout from it, no mater what wagering requirements you will place in your terms. Well myself I am not big fan, actually I never liked their top games, but given as a free bonus why not to try them. So that way I decided to sign up at their casino, by my mistake not reading their bonus terms. So I downloaded the casino used the quick sign up process and when I logged in there was no 40 euros free chip for me. The next thing I did is contact the support, which they were friendly at least so they told me if I fill up my profile, placing all my general info I will be given the bonus. When I did that the support gave me the free bonus, but just like I knew it and asked what’s the wagering of the bonus, so I should know and where can I check that, the guy from the chat support answered me that this bonus is not cashable, so it’s given only as a free fun bonus so we could try their games. Well Diamond casino, if I wanted to use free or fun play I would use that option and never would sign up at your casino, so making traps for players is not nice, because there will be thousands of players which will not read neither ask for the bonus,but they will be playing and will expect that if they wager the bonus they will be cashed out.Well sorry dear players this is only fun money playing, so don’t waste your time, if you want to play here, just make a deposit because they seem like nice casino. Although there are few complaints, but I guess it’s for delay of their payout. While I was looking for some no deposit bonus to play in some casino I came across a very criticizing review here at Gamblers. It was about Black Diamond casino so I decided to check it out. I went to their website and I have to tell you I really liked the design and the flash animation. It gave the casino a really luxury look, all diamonds and gold. I downloaded the software, installed and made an account with no problems at all. As soon as I started the software I got a message from live chat support. Norman, he’s a really cool guy. I asked for a no deposit bonus and I got 25 euros on my account instantly. I don’t remember if there was a wager or not I was gonna spent it all just to play for fun anyway. I looked around the games they had to offer Jackpots, Roulette, Blackjack, Video Poker not my kind of games. Off to the video slots! Almost 40 games of video slots. Now the fun starts. Went to the first game Dice and Fire press play and I’m looking at the DMX Games logo for about 3 minutes.I lost the will to play and I haven’t even started yet Started down and I see a Beauty Salon game. Makeup, nail polish and perfume everywhere. A good game if you’re 10 years old. Then I hit the jack pot. Diablo 13. I immediately liked the graphic. 13 lines 0.01 minimum bet per line 0.13 bet for 13 lines. Started playing didn’t know which symbol was scatter which was wild after a few minutes got 3 fairies and 10 free spins. On the third spin another 3 fairies extra 10 free spins a few more spins another 3 fairies. I got a total of 30 free spins after a few minutes of playing. I didn’t win much because I was playing with minimum bet but I loved the free spins. After a while I got a bonus. Two dungeon doors and you choose one. I clicked on one and I see 150. I thought I won 150 euros but unfortunately it’s 150 x your bet so 150 x 0.01 = 1.5 euros. Of course I increased the minimum bet to 1 euro and slowly but surely lost all my money.